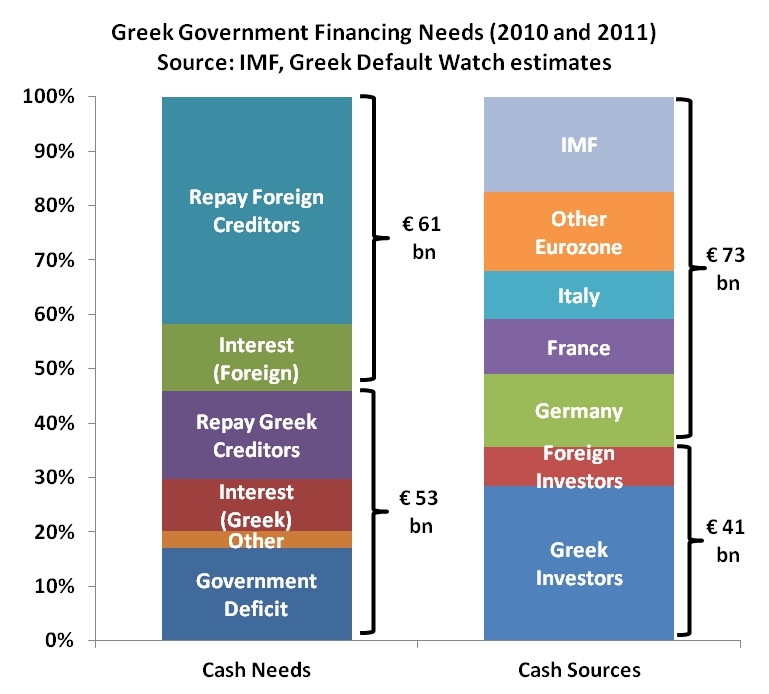 Greek Default Watch: Who Bailed Out Whom in Greece? Who Bailed Out Whom in Greece? We often say that “Greece got a bailout.” But is that really accurate? 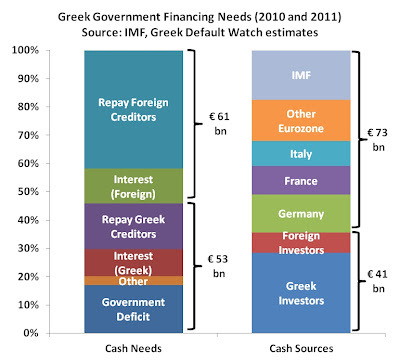 If you think you understand the Greek bailout, I would suggest you take a close look at the numbers below. What I have tried to do is look at Greece’s finances for 2010 and 2011 to answer three questions: how much money did Greece need in 2010 and 2011? For what purpose? And who provided that money? The answers are really interesting. The analysis is based almost exclusively on published reports by the International Monetary Fund. Since the numbers do not quite add up (in the IMF’s own documents! ), I have made some minor adjustments and I have also, in one case, made an estimate (the split between interest paid to foreign investors versus Greek investors). Where possible, I have consulted third-party sources such as the Bank of International Settlements. I believe the margin of error in the calculations is pretty small. 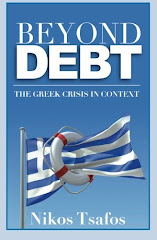 Overall, Greece needed about €114 bn in 2010 and 2011. Of that, however, only €53 bn stayed in Greece to finance government spending, provide assistance to banks, pay interest to Greek creditors or repay maturing bonds held by Greeks. More than half of Greece’s cash needs, or €61 bn, went to either pay interest to foreign creditors or repay maturing debt held by foreigners. Now let’s look at where this money came from. Around €41 bn came from private investors, of which 80% were Greek. The rest of the money, €73 bn, came from the bailout provided by the official sector. Germany, France and Italy supplied €36.6 bn, the rest of the Eurozone members provided €16.5 bn, and the IMF provided €19.9 bn. Looking at the numbers this way, the EU and the IMF gave Greece €73 bn, of which €61 bn went to pay foreign investors who held Greek debt (via interest payments or via receiving cash when their bonds matured). If you mentally split the world between Greece and the rest, then Greece needed €53 bn “for itself” to pay the bills, pay interest to its own investors and honor the debt held by its own people. The Greek government was able to raise €41 bn of that €53 bn from private investors in the market (in fairness, this was partly aided by the European Central Bank making cheap credit available to Greek banks). But in a very narrow way, the cash provided by foreign governments and the IMF to support Greeks per se was roughly €12 bn – the rest went to foreigners. Even if you assume that all market financing was made possible by ECB-funding, more than half the assistance was still geared to foreign investors. I have no intention to draw any grand conclusions from this analysis. But it is important to precise when we talk about matters that have acquired an extraordinary political and emotional significance. And instead of merely saying “Greece gets a bailout” we can be more accurate about who is providing how much money and for what purpose. This crisis requires nothing less of us. Yes, you are right in your analysis. It is not a secret, it's just something which no one likes to talk about. Already last year, a reputable address (I believe it was the FT) published an analysis that only 19% of the new rescue loans stayed in Greece. How could it be otherwise? The budget deficit of 2010-11, which needed to be financed, was about 40-45 BEUR. So when you borrow roughly 200 BEUR (your numbers do not include the ECB-funding) to finance that kind of a budget deficit, you know that most of the money goes elsewhere. Bottom-line: "Help to Greece has so far meant primarily using Greece's balance sheet and tax payers' money to bail-out banks". You're absolutely right and thanks for the link. Indeed, it's no secret but no one wants to talk about it. I think we all know the big picture story but I hadn't really seen the numbers broken down that way before and I think it's a useful way to look at this (not just for Greece but for the other bailouts). Is it not fair to say that allowing the "restructuring" or forgiveness of debt was also a bailout? It certainly had that PV benefit to Greece. The restructuring,not exactly.The recapitalization of the Greek banking sector however is. So, Selene, the restructuring worth 100 bn was not a bail out in your world view? The 100 bn net present value which Greece borrowed but didn't pay back, forcing different foreign stakeholders including tax payers to food the bill for you? You are aware that it included banks and different companies which lend for example to Greek state owned companies or hospitals, giving them a customer credit, aren't you? You are aware that part of the bill was paid by tax payers in countries which nationalized some of their banks, don't you? Why is that not part of the bail out? Because Greek banks and pension fonds had to participate as well since they had been "smart" enough (or rather not) to lend money to your country? Would you have preferred a 100% hair cut, preferably only for foreign banks, letting them go bust and causing another Lehman brothers case and forcing already troubled countries to nationalize even more banks? It is this impudence which makes me sick of you people down there in the South East. Anonymous: the short answer to your question is that the restructuring is affecting 2012 finances, not 2011. So it's not included in this analysis for that reason. Now debt restructuring is always painful and the "fault" is both on the borrower who is not honoring their obligations as well as on the lender who did not do their due diligence. So if I can borrow your words, you can be "sick of you people down there in the South East" but perhaps you can also "be sick" that your own bankers and insurance companies and pension funds kept lending money to Greece as if Greece were Germany. There is enough fault to go around for all. Now if you look at the numbers above, you see that a bigger share of the 2010-2011 money went to honor the obligations towards foreign creditors rather than domestic creditors. This means that when the restructuring came in Q1 2012, the remaining ownership of Greek debt had relatively more Greeks than it did in 2010 or 2011. In fact the remaining foreign ownership was much smaller in 2012 than in 2010 or 2011. In that sense, a restructuring in 2012 was better timed for foreign creditors than Greek creditors (and that was partly the idea - give time to banks to shore up their balance sheets and prepare for a Greek default - including by lowering their exposure to Greece). I have no intention of looking at these numbers through a highly moralistic lens - I don't want to be sick at anyone on either side of the transaction. But since people look at this in a very emotional way, it's good to precise. A tad over-defensive,are we?What I meant to say is that the haircut wasn't exactly forgiveness of debt,you know,because Greece could still unilaterally declare insolvency and have a haircut.Greece is and will still be banned from the bond markets for many years,even if the PSI had been involuntarily enacted.Yes,CDS weren't triggered(if the had,this would've indeed caused massive unrest in Europe as you say),but investors and banks in and outside the country suffered losses-how is that different from an up-front bankruptcy?It's not,why else did Ireland and Portugal not demand treatment to Greece's?The real difference is that Greece can still secure aid from its Euro partners even after the haircut.So,please drop the attitude. Hi Nikos, I have no intention to look at all this through a highly moralistic lens either. I am fully aware of the fault of both borrowers and lenders. And I agree with your analysis. And I apoligize for my indeed emotional and stupid comment since I do not like stereotypes either. Nevertheless, I do not accept the view that a 100 bn NPV debts relief is not part of Greece's bailout, no matter if it is included in the 2011 or 2012 statistics. If GDP keeps on shrinking altogether, of course the debts ratio is not improving that much after the hair cut since the annual deficit is still high, creating new debts. Think the other way around: Where would the debts/GDP be without the hair cut? And the time which was bought for foreign banks was exactly that: time to make the private hair cut possible and help Greece without causing a bank melt down. Let's not be naive here: It wasn't the last hair cut for Greece, the next will include public lenders. And there is no free lunch, Greece cannot just decide to write off more unilaterally since the country depends on foreign aid to avoid full default and social chaos even if it returns to the Drachma. Since it is good to precise, one shouldn't look a gift horse in the mouth and claim that the gift didn't help after profiting from it. Because that would be impudent. *"Why else did Ireland and Portugal not demand treatment SIMILAR to Greece's? "I missed a word. The CDS were triggered, it was an official credit event. And as you can see, there is no unrest in Europe. There would have been unrest if Greece had defaulted unilaterally, but some more unrest in Greece itself. And in fact, triggering CDS was the best which could happen since market participents learnt that their CDS are worth something. Ireland and Portugal are of course not doing the same since 1) the private hair cut was a mistake from the beginning, helping Greece to a certain extent but causing collateral for countries like Italy and others. Ireland and Portugal wouldn't benefit from more market turmoil 2) They plan to return to the markets as soon as possible since they cooperated with their lenders from the very beginning, backed by the majority of their population... not like Papandreou. I was under the impression that only investors who had purchased CDS and refused to participate in the debt restructuring recieved their share.And it was no more that 3 billion USD.Oh,if the debt reduction was a credit event,then it wasn't a gift,was it? And for the record didn't Italian,Spanish and even Portuguese spreads begin to decline(in fact I remember that stock markets in Europe were performing very well)as soon as it was announced that the haircut was a success,up until the EC found out that Spain was missing its budget targets?Greece first needs to sort itself out-and I agree that many here need to change their attitude and conform to the new reality-before it ventures into the bond markets again and it won't happen when the lenders prioritize drop in living standards over reforms.Yes,it's hard to deal with South Easterners like us,but it has to be done for the benefit of everyone. My dear Selene, a debts relief worth 100 bn is a gift independent from being a credit event and despite the fact that the banks profitted as well from avoiding a full default. As I said before, the gift is paid by stakeholders of the lenders. Bond spreads declined mainly because of the LTRO, but also the success of the hair cut including the triggering of CDS which improved the functioning of bond markets again. Before investors thought that CDS weren't working and souvereign countries in Europe could default... which is not a good combination and let the Eurozone almost collapse. Those who planned the hair cut did so against the advice of the ECB and Papademos himself since they weren't considering the markets' reactions but wanted the banks and not tax payers food the bill and make Greek debts at least a bit more sustainable. And I am sure they didn't expect Greeks' negative reactions to to it. If you'd like to change your attitude I'd recommend you to stop thinking that Greek politicians are puppets which can only do what the Troika tells them. And some useful reforms were simply not implemented due to vested interests. Wasn't that the rationale of the European bailout for Greece, to acquiesce the financial markets? So it shouldn't come as a surprise that most of the money went to foreigners: they simply happen to be the majority of Greek bondholders. Besides, the Greek National Bank seems to be printing it's own money, kind of, being allowed by the ECB to accept sub-substandard "securities". Considering the fact that this game will have to be paid for by all members of the Eurozone via higher inflation rates, it would seem to me that Europe is subsidizing Greece to a much larger extent than the IMF- and tax-financed official payments. I don't think restructuring of Greek bonds was fair. Face value was used instead of purchasing value that is more favorable to the speculators that bought at junk price than private persons that bought near face value years ago. There are no differentiation made between private persons and private institutional investors. It seems from the graph above mostly Greeks suffered from this unfair restructuring.